Why should we have to eat gross, subpar protein bars and the like? It’s nearly 2019 and I think we all deserve better. Enter these protein cookies. Full of pretty much exactly what you need to recover and refuel for whatever training or adventures you are taking on, these cookies are more than enjoyable to eat as well. There is no reason to choke down a bar that you are only eating because you feel you have to for proper recovery. These cookies give you the nutrition your body wants in a delicious, fun to eat package that I bet you will be looking forward to for a change. Challenging your body through a hard training session, a long hike or bike ride, or tough game or match uses up muscle energy stores, called glycogen. Muscle fibers become damaged as well with exercise as we push them to their limits for the sake of performance. Nutrition is key in providing the carbohydrates and protein needed for muscle recovery. Carbs refuel glycogen stores and protein provides both the stimulus and substrate for muscle rebuilding. These cookies have just the right kinds and amounts of nutrition to give your muscles what they need to refuel and rebuild. One of these chewy, peanut buttery cookies has 373 calories, 20g protein, 53g carbohydrates, 10g fat, and 3g fiber. A cookie would also be an option for a smaller meal replacement on the go, or even a snack for a larger athlete with higher energy needs. Or hello perfect camping food! The ‘batter’ for these cookies is definitely not your normal cookie dough. It is a variation on my go-to no-bake protein bars that just gets shaped and then toasted in the oven to look a lot like a real cookie. 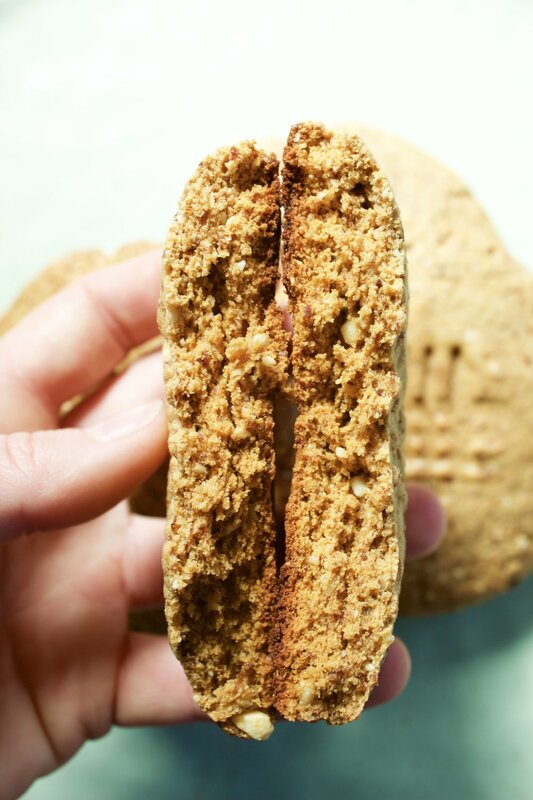 The texture is both a little crisp on the outside and chewy on the inside with little bites of crunchy peanut, all very much like what you would expect in a traditional cookie. I am not going to say this is a real real cookie, because it’s not. But, the taste, texture, and looks might just convince you otherwise. Hope you enjoy! Place raisins in the food processor. Blend about 30 seconds, until mostly broken down and formed into a ball. 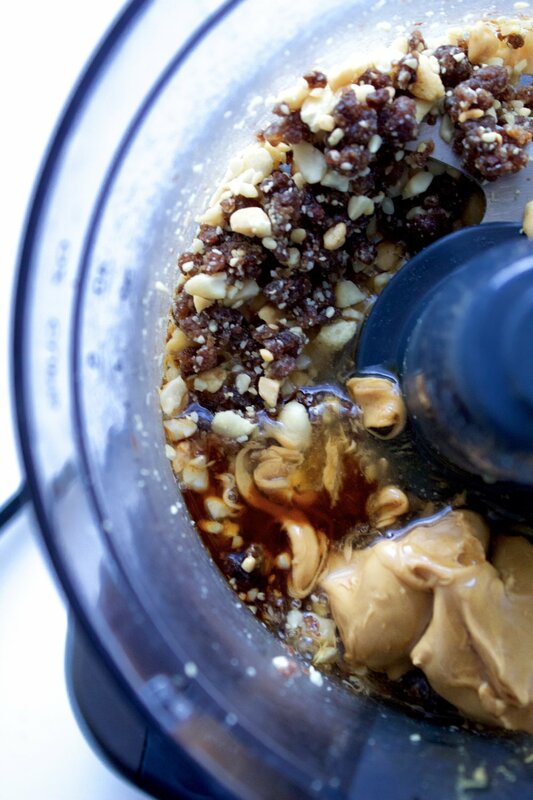 Add peanuts and blend until broken down into pebble sized pieces. Add the corn syrup/honey, peanut butter, and vanilla. Blend until evenly incorporated. 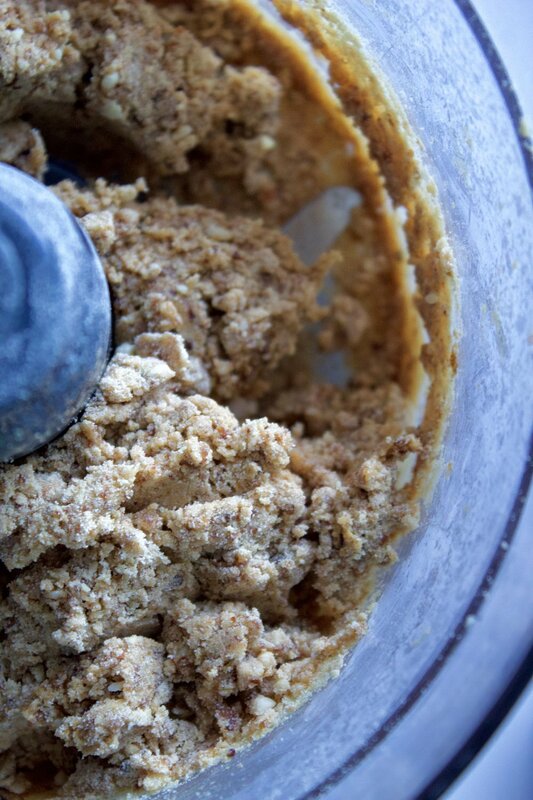 Add protein powder in two batches, blending until fully incorporated after each addition. Use a spatula to push down mixture to help blend if needed. Divide mixture into 4 even sized portions. Roll very firmly into balls. Place on a parchment lined sheet pan evenly spaced. Press down cookies to about 1/2” thick (1.25cm) using your hand or bottom of a measuring cup. 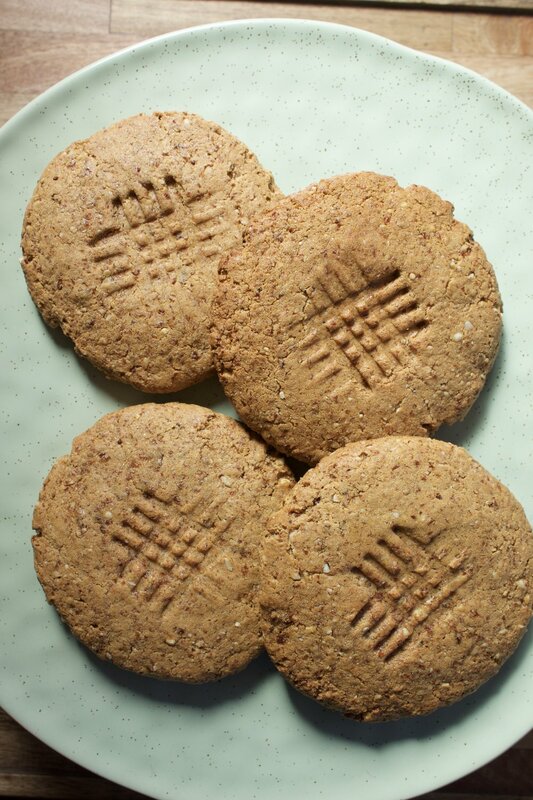 Use a fork to press the cross hatch pattern in the middle of each cookie. Bake in the oven for 10-12 minutes, or until cookies just start to get golden around the edges. Remove from oven and cool. 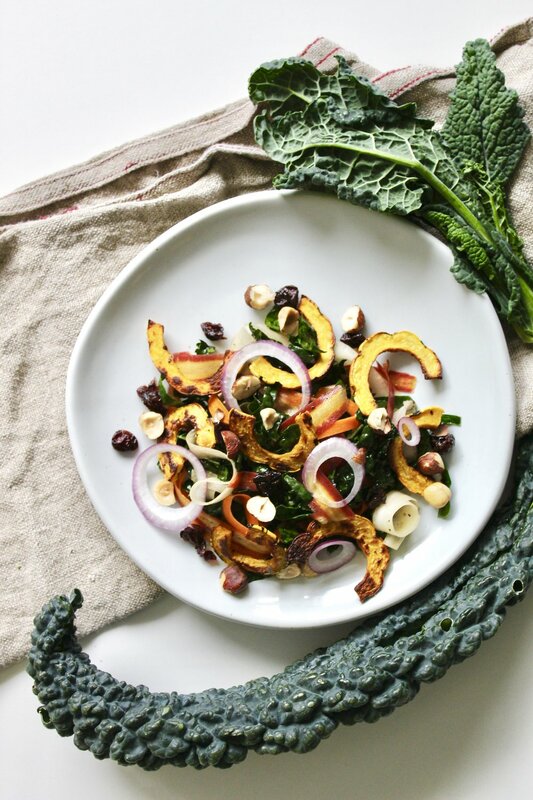 Notes: Make sure the raisins you are using are fresh and plump looking. Older, dry looking raisins won’t contain enough water to help bind the mixture together. I used whey protein concentrate to get the protein content desired in these cookies. If you aren’t using whey protein concentrate, look for a protein powder with at least 20g protein per 1 scoop (about ¼ cup) serving to get the same amount of protein here. After cooking, I stored these cookies covered on the counter for about 3 days and they maintained good taste and texture. Storing them in the fridge is also another option that might keep them even fresher.